When I was growing up, there was a small drawer between the sink and the stove that became the catch all spot. It never had any other name than “the junk drawer.” It was the home for anything that didn’t fit anywhere else. Pens, tape, nails, keys… you name it and there was probably one (or more) in that drawer. I also remember that anytime my mom was digging around in that drawer she was highly irritated. If she was looking for something, it was a source of frustration. If she was cleaning it out, it was a source of frustration. I think I even remember a picture of my mom looking up from that drawer! Why do we create places in our home that end up being a source of frustration? 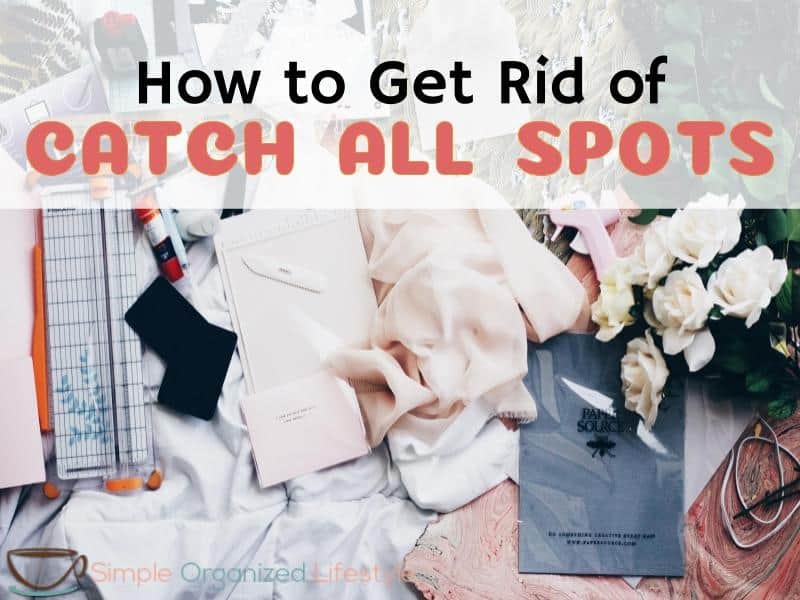 Maybe you also have a junk drawer or you call it a catch all spot, but it’s a place where you put something for usually one of two reasons. 2. It doesn’t have a home. We don’t have a junk drawer but we definitely have catch all spots. Our kitchen counter can be cleaned off and, within minutes, something else has found it’s way there. It’s where we usually drop off whatever is in our hands when we come in from work, including our keys, mail, kid’s paperwork, drinks and everything else. If those things do not get put away, it quickly becomes a catch all spot. The only way to tackle a junk drawer or a catch all spot is to give the things that end up there a permanent home. Start small, focus on progress not perfection, and give the loose items a home one by one. A magnetic cup on the refrigerator that holds pens. A key holder right when you come in the door. Nails go into a bin in the laundry room. Since we wear FitBits for watches, we have a basket for our them beside our charging station. School paperwork is still a work in progress with a pre-schooler so that is definitely a system I’ll be working on before Kindergarten next year. There’s a quote that says something like “everything in its place and a place for everything.” It really is true when it comes to preventing a catch all spot. How do you prevent a catch all spot?